Donald Daccache, minister Nicolas Sehnaoui, Jocelyne Chahwan, Rima Frangié, minister Rony Areygi, deputy Jean Oghassapian, Dima Jamali and Dr Hassan Younès. 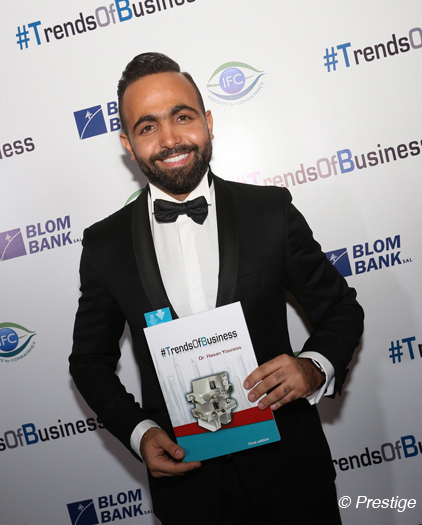 Under the patronage of minister Rony Araygi and in partnership with Blom Bank, Dr Hassan Younès dedicated his book Trends of Business in a ceremony that brought together an array of businessmen at Four Seasons Hotel. Several speakers praised Dr Younès initiative, which, through his writings, wanted to emphasize on corporate social responsibility, the Internet of things, innovation, new forms of Marketing and leadership, trends in finance … so that a company can provide added value to the market. Trends of Business, addressed to companies to invite them to follow new trends in the market, will be adopted in universities.